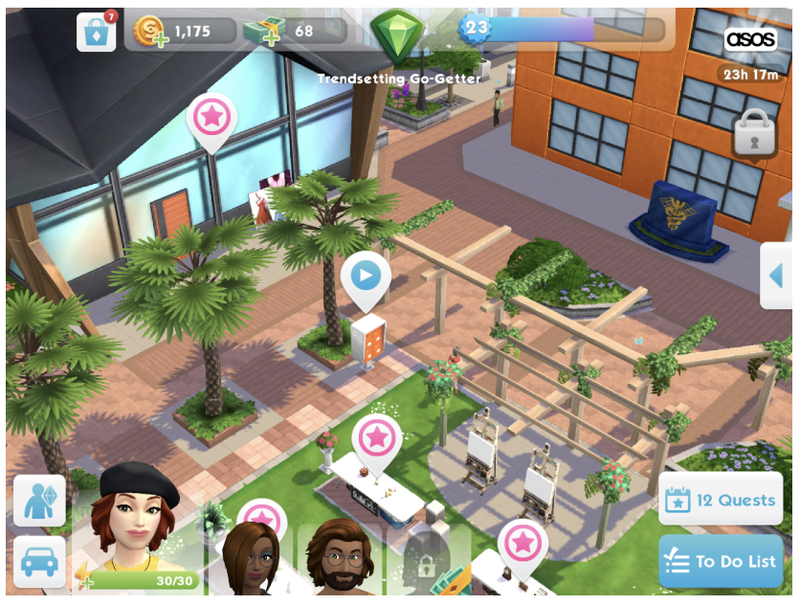 The Sims Mobile launched globally in early March 2018 after a long and tumultuous soft-launch, during which massive changes to the game mechanics were made. Yet despite the fantastic visuals, long soft launch and the support of an internal benchmark, Sims Mobile tumbled down. It took less than a month for the 6-year-old Sims FreePlay start outperforming the sequel in terms of revenue despite the fact that Sims Mobile daily installs were over four times higher during the same period of time. It would be easy to make a case, based on numbers, that launching sequels on mobile is not the way to go about it. After all, there are more than enough warning examples. But the Sims Mobile didn't fail because it's a sequel. The game failed due to much simpler and obvious reason: poor design that didn't deliver to what made the Sims a great franchise in the first place. *Please remember that we love games. Our goal, as always, is to deconstruct what successful games do right and to understand what keeps other not-so-successful games from reaching their potential. We are all game developers and understand very well how hard it is not only to launch but also to grow a game. Build > Launch > Learn > Repeat! The genius of the original Sims PC franchise lies in its approachability. It is easy to understand what is expected from the player and the Sim alike: The actions and choices are intuitive, learned from our own life experiences. The metrics of success do not have to be explained, because they are inherently ours: Make more money, get a promotion, get married. The franchise builds on our own fantasies about how we live our lives. Matt Brown, current studio technical director of EA Maxis, spoke at this year’s GDC about emergent narrative in the original Sims, and how the game combines a natural human tendency to nurture for others with the Maslow hierarchy of needs. Each character has her or his needs - down to a relieving their bladder. Sim needs to get a job! Furthermore, a Sim has some automated behavior that tries to address pressing needs and loosely following on whatever actions they’ve been doing before. A Sim who wants to become a chef and has a career in a restaurant is more likely to start cooking on his own. If you have a house with multiple Sims, this is the developers helping you to keep the Sims on the path you’ve chosen for them without having to control every moment of their lives. This mechanic also builds an immediate next goal: Read books to level up your logic skill to get a better career. Talk to a person until their relationship reaches a high level, so you can get married and have kids. All in all, the game is a great combination of actions the player can control and those the player has to respond to. Regardless of your story: freedom, feedback, and intuitive goals are the trademark features of the brand and the design principles on which the narrative is built. The Sims Social launched 2011 on Facebook. The Sims Social (the Facebook game) ruled the top charts for a bit but then quickly fell off. Sims FreePlay (iOS, Android) and has been a staple of the top games on mobile since 2011. The mobile version used timers to break up the sessions and provide progress in times of player’s absence. These timers break the flow and make the game feel very different from the original, but it keeps its stable audience, presumably because the it stays quite true to the brand’s principles, keeping the narrative choices similar as in The Sims. Use of timers in Sims: FreePlay. Each Sim’s action takes time. The new Sims Mobile game was soft-launched in May 2017 in Brazil and launched globally this year in March. From the very first moment, you notice how different the game’s visuals are. It walked a long way from the quirky, robotic animations in Sims FreePlay into a very polished, full 3D experience with a wide range of animations and short loading times, resembling the Sims 4 PC game. The Latest Sims Mobile. It Looks almost like the PC game! The quality of art is top notch, from characters to environment and animations. So how did the latest Sims Mobile game do? In the past weeks, the old game, Sims FreePlay, kept its position in the Top 100 grossing. The new Sims Mobile hasn’t maintained a rank in the top grossing, roughly flattening at $50K/day according to Sensor Tower across Android + iOS. Apart from the launch week, Sims Mobile has grossed less than it's almost 7 years older predecessor. Granted that Sims FreePlay is in a cash cow mode, where the majority of players has likely been playing the game for a significant time and are regularly spending. What is curious to see here is that the installs for Sims FreePlay are now matching the installs of Sims Mobile. This increase in installs can be seen as an increase in the revenue of the legacy title. A sign that EA is potentially shifting its focus from the new Sims Mobile to the old and trusted Sims FreePlay. These metrics are far from stellar for a game with such high visual polish that spent almost a year in soft launch and taps into the faithful audience of the franchise. So what happened? Why didn’t the Sims Mobile leapfrog Sims Freeplay? Instead of controlling an unlimited amount of characters and houses, like in The Sims and Sims FreePlay, in Sims Mobile the player controls only up to four characters that share a house. In Sims Mobile, you start with two Sims, two other slots can be purchased. However to keep things interesting and let the player live different stories, at some point Sims can retire. This frees a slot for a new generation. If you choose to retire the Sim, they will hang out around the house, offering special actions rewarding Heirloom tokens (family currency), and eventually will be “moved out” to a farm upstate and be permanently gone. If your Sims have a baby, the similar process happens as it grows up. Heirloom Tokens allow the player to purchase Lucky Charms that unlock and boost traits you can assign to your Sims. The system works well: Player doesn’t get overwhelmed by controlling too many Sims, exploring differently flavored stories comes naturally with new characters, and last but not least there is a tangible heritage from the previous generation, which is a great metaphor. It also serves as a retention mechanic for achievement-focused players. In my opinion, focusing player’s attention on a limited amount of characters and creating a heritage achievement system is definitely a good step for a mobile game. Retirement and receiving a new Heirloom. Granted my sim Eva looks very young for a retirement. I believe it's the healthy life-style I got her into. As a player, you can assign your Sims to events, which are basically quests with different duration. Events are part of Stories: Career, hobby, and relationships. 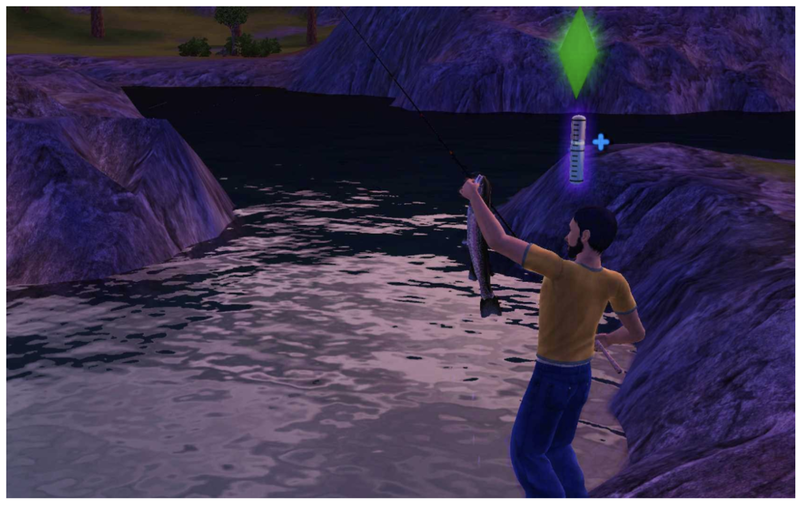 For hobbies and careers, only one can be active at a time for each Sim and switching it costs Simoleons. Relationships can be explored in parallel, which keeps the game to one of the most cherished traits of the original. The only limited resource here is player’s time. Each Sim can be assigned to one event at a time, and it will finish itself. This lets you progress without actively playing. To give the player a chance to act, each Sim also has energy that can be used to perform optional actions within the event to speed up the timer and finish earlier. Player chooses the actions through interaction points that are only available during the event. The events feed both into the player progression and the Sim progression. 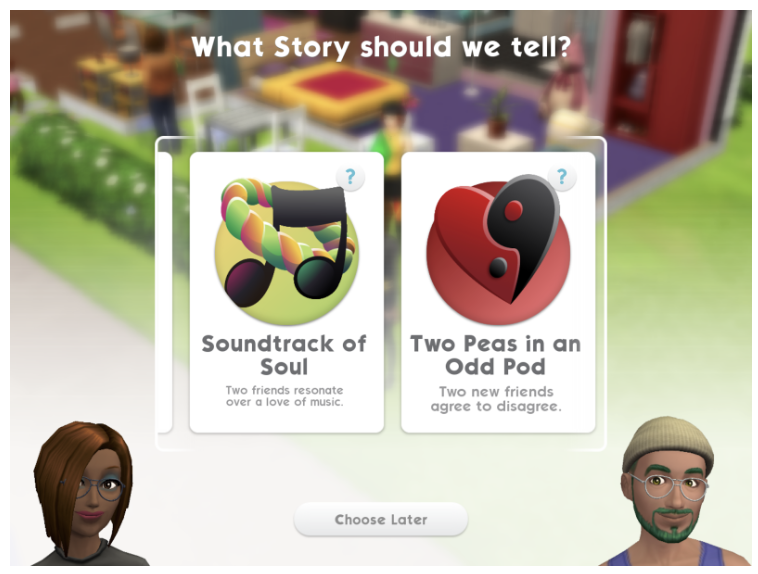 It ties the two loops together: Completing an event means XP for the player and a progression in the story for the Sim. Player’s XP comes mainly from completing events. They unlock new parts of town and careers, furniture, building blocks, and outfits. Decorating and buying clothes increases vanity level, which serves as a visible comparison between you and your in-game friends and unlocks more space in the house. From this graph: the two loops, Sim progress, and Player progress feed into decorating. Therefore the player’s motivation should lie mainly there. The motivation to complete the loop is tied to the social driver of comparing houses and clothes with other players. Clothes and cosmetics for your Sims are different than decorations. These cost Simoleons (soft currency) or hard currency and add to your overall Vanity level. Most clothes and cosmetics do not have a game effect. To get clothes with in-game effect players have to go to a special design that will generate random - and very unique - clothes. These clothes give a boost for an activity and usually highlighted with a particle effect. 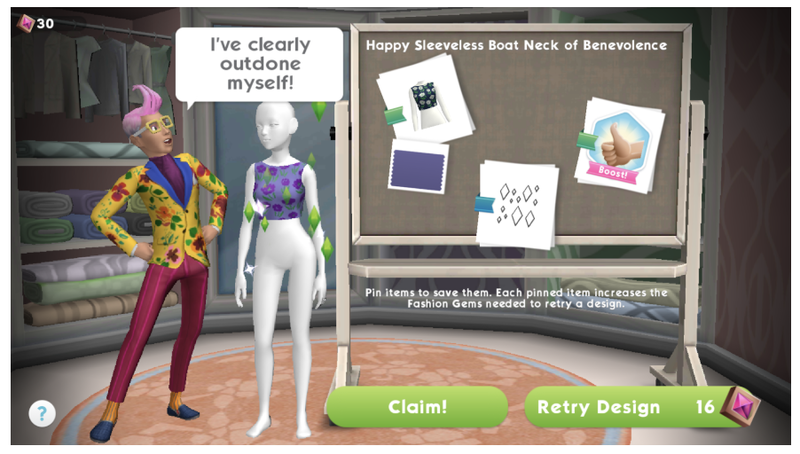 To make your Sim visible to other players, you have to attend parties. You can throw and visit thematic parties (wedding party when you get married, music party when you play guitar as a hobby etc.). These happen in parallel with other players. While the actions you perform are asynchronous (and act same as actions within an event), you do have some option to interact, such as a real-time chat with all the participants. Party actions: Career/hobby progress unlocks objects the host placed in the house. The real party trick though is the fact that a player can chat with other players attending the party. No Sim game would be complete without all the wonderful strangers you can meet and Sims Mobile take some steps out of the single player by introducing an asynchronous system in which your neighborhood is populated partly by NPCs and partly by other players’ Sims. You are assigned to a group of players and for you, your neighborhood is frequented by the same characters: allowing you to slowly build relationships with them. This resembles well a lively neighborhood. 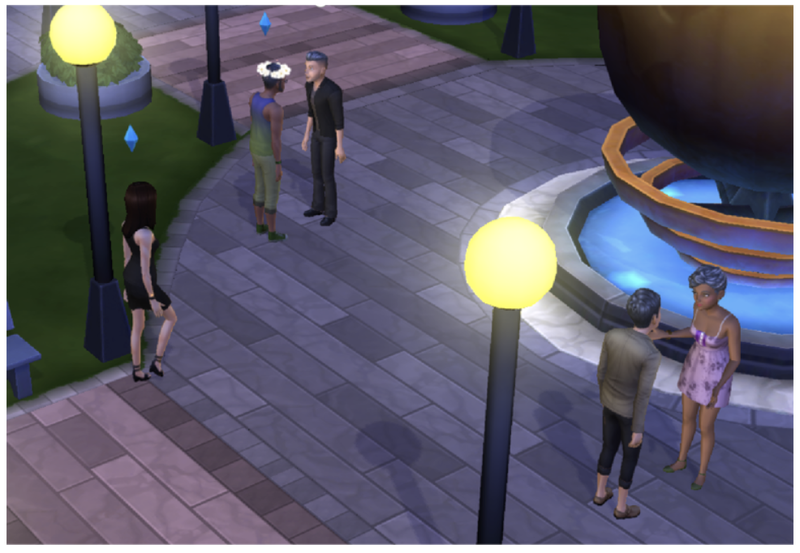 Sims you befriend will stick around, being more likely to pass by your house. Sims you don’t care about you will stop seeing -- and you won’t care. It would be interesting to know how these neighborhoods are updated over time; whether new players are added when the old ones churn. The social loop is way too far from the core to serve as motivation, and as I’ll show, it’s not sufficient to drive player through the game. While the first part focused on visible systemic changes that were introduced to streamline the game for f2p and mobile, in this part I will talk more about design under the hood in order to get to the answer for our initial question: Why is the game not performing well. I want to post a hypothesis: We’re seeing the game struggling because it lacks meaningful choices or goals, it mechanizes motivations, and it doesn’t reward the player. These issues do not exist in a vacuum, but they are the biggest part of the systemic oversight of player motivation. As I’ll show, the lack of meaningful, immediate actions diminishes the ability to care for your Sims. Hard-to-read progression defies a will to grind for better objects. Funneling the core loop into social leaves the player out to dry without feeling rewarded. Through intrinsic motivation (Sim is hungry) comes caring (I need to care) and emotional attachment. Caring for the needs is the building block of the game, like swapping candies in CCS, you’ll repeat this action, again and again, driven by curiosity what happens next. By completing these steps a set of more complex needs emerge such as relationships or and career. Just like in real life, player ponders: How do I afford a better house? Because Sims need the player, the player cares for the Sims. This is where nurturing builds the narrative: Completing these steps naturally tells the story. Because of the combination of intuitive, human needs, the ability to fulfill them through game mechanics and a clear feedback, the game doesn’t need to take the player by the hand. Originally, setting up your house is finding an intersection of affordability, function and personal expression. Furniture caters the needs or improves skills (learning). Better furniture makes for faster progression, and granular improvements to your house also improve your Sims’ overall well-being; Sims want to live in nice houses. 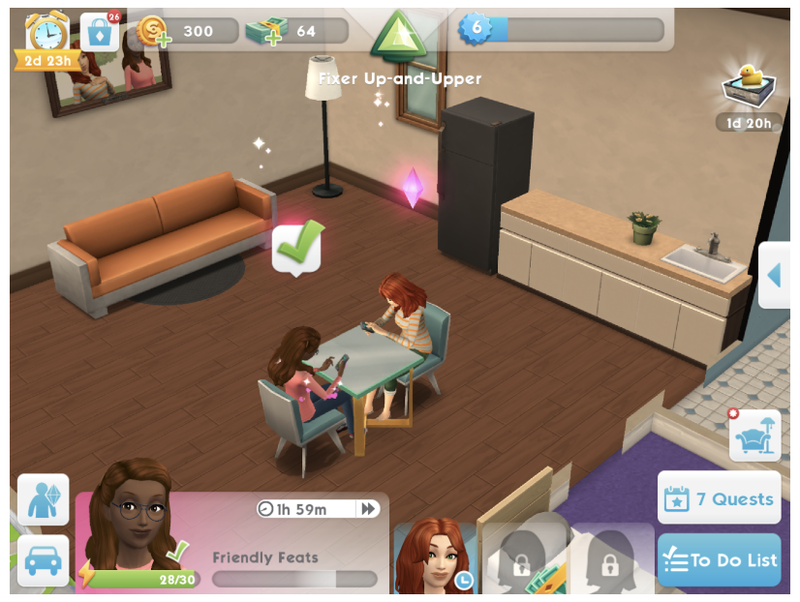 In Sims Mobile, players can still interact with the furniture but since no needs are present, the interaction doesn’t provide any feedback, neither for the Sim or the player. The player is therefore left with limited motivation to purchase furniture. The only game accepted push to decorate comes from the need to improve their vanity. Dropping stats and gameplay impact from furniture for the sake of a simplified experience cuts a major value of the experience. Without this rewarding loop from furniture, a whole part of the game disappears that could have served as a compelling experience for a casual audience. Watching TV while playing Candy Crush is a good example, however, games with metagame (building on ownership and personalization) are even a better one: Interacting with your game with a slight sense of progress can be a great and rewarding activity. It further fosters the ownership of the space you’ve built. Having a reason to stick around meaningfully makes you retain better. In Sims Mobile, this leads to players coming in only for short, effective sessions. 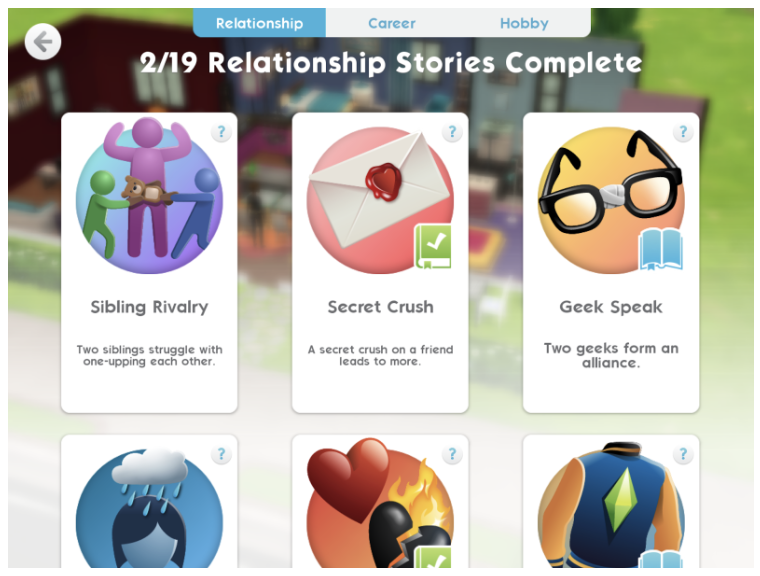 The intrinsic narrative of building up your sim and collecting furniture is replaced with the extrinsic motivation of just completing the stories/quests for rewards and progress. Players that are coming in just for extrinsic motivation (rewards and coins) won’t stick around for long. They eventually need intrinsic motivation (social proof) to retain for the long haul. 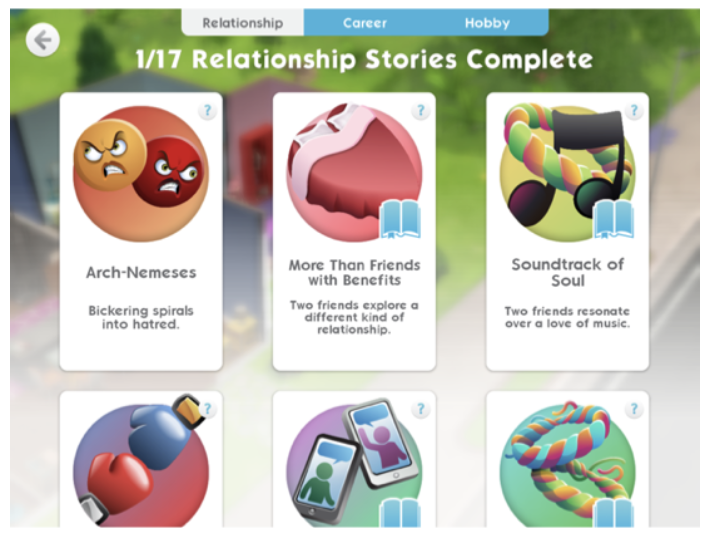 Here The Sims Mobile really misses out on what made the PC version of The Sims so successful: it's an accurate portrayal of relationships in real life. Relationships are ever changing and it’s unclear where things are going. Locking down a relationship into a pre-set story pushes you down a path with no option to take a side road apart from abandoning the progress in the story. Through this, the motivation to progress becomes extrinsic since the choice of what happens next has been taken away. There is no surprise, no option to grab the steering wheel and have a fight in a romantic relationship. Pursuing achievements also takes away the option to play freely: Instead of playing what I want, I play what I want to complete, creating a detachment to my Sim. The removal of the nurture aspect has a huge impact both on the system and the player. It takes away natural onboarding and therefore complicates a relationship you could have built to your characters. It reduces the internal motivation by making the play aspect insignificant. By attaching story progression to events only, the game builds a pre-set habit of collecting rewards, assigning events and leaving the session. 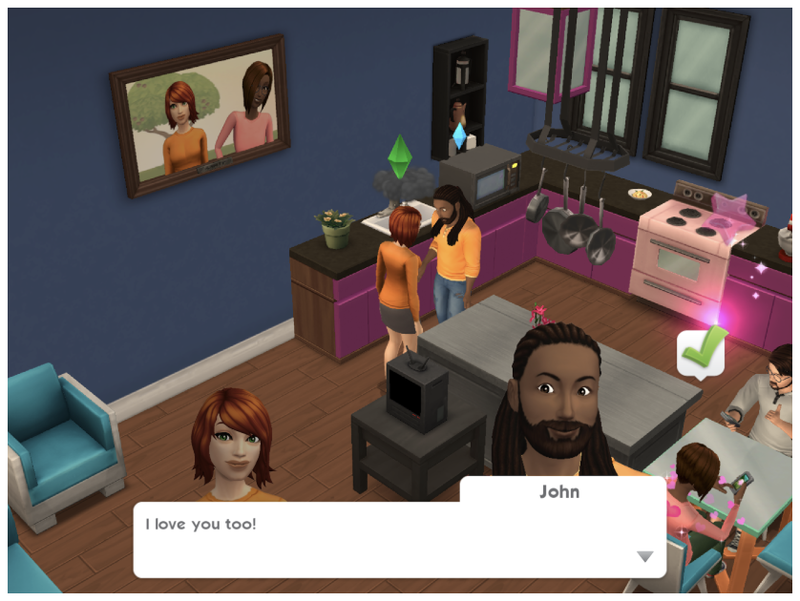 A player never builds up a connection to their Sims which is not healthy for long-term retention. After playing the game for some time, you may start feeling like you’re not progressing. Only after looking closer at the event system it starts to be apparent why. The game features a clear yet highly unintuitive progression, which makes the player wonder if they are making any progress at all. To recap: Events have varied durations that player can choose from. While in an event, they can use energy to perform actions and speed up the timer. The energy is bound to the events: Using more energy means the player can finish more events and progress faster. And each Sim has their own Energy. It all sounds simple and clear: the player can engage with the game with visible progress in the events, which allows them to get more done in the same amount of time. But, it doesn’t feel good. Here’s the first problematic part: You can select actions that are meaningful to you, but the result of a story event is the same regardless of the input. You will level up a relationship with your sweetheart whether you are cooking, watching TV, or talking about romantic plans. Or if you leave the game and come back later. Within each event, the relationship between energy and time discount is the same. That further undermines player’s choice of actions (from event’s perspective they are all the same). Next to those meaningless Actions that have no game impact (outside of an Event) we now have mechanical actions. You’re bound to the result from the start. It’s like sitting at a math test, knowing that you can wait it out without writing anything because in the end, you will pass. The result is: Energy doesn’t have story value. Or, to put it differently, energy is merely a means to grind. Second problematic part is the hidden relationship between energy and Event XP. While events in different career levels have the same duration, using energy provides a small discount on higher levels as the absolute amount of event XP grows. It’s an invisible cost to your progression. At the same time, it’s not clear if your energy will be enough to get through an event as the absolute amount of event XP needed isn’t shown. In reality, the game value of energy is determined by the event type (typically family events go very fast), career level and quest duration. As a result, the player has no idea what progress to expect in a session, which undermines their will to plan and set goals. Even when this behavior is not technically in a way of playing the game, it shows that energy is designed and implemented into other systems only for gating and pacing: It only really starts to matter if you push for event completion in a given time (in live operations for example). In a quest based game, the reward is usually a function of game progression and duration of the quest. Simple progression can expand rewards: With player’s level, the reward grows. Or it can grow the quest timers: Players need to come back less often, which is a common practice in F2P games to lower session amount over time and not wear the retaining player out. In reality, it’s usually a mix of both and either of these gives the player a good understanding of their progression since there’s always a tangible gain. Reward is usually a function of game progression and duration of the quest. Quests either reward less but pull players back faster or reward more and keep player away for longer period of time. As a result, the player can do more quests and earn more rewards within the same amount of time. This decision is interesting because this is not how we talk about getting a raise in real life. “I’m earning $200 per hour instead of $100 per hour”. In Sims Mobile, it’s “I’m earning 200 simoleons in 1 hour instead of in 2 hours”. We use time, the most stable, straightforward, linear measure as a comparison. Relating to different time slots doesn’t feel as an intuitive progression. The different careers also don’t differ enough in earnings (which you would expect with being a barista versus being a top chef) and throughout them, players do not get significantly better off with coins either. This is particularly apparent later in the game when furniture and clothes become gradually more expensive and the player is less and less able to purchase them or complete sets. From a system perspective, the flattened progression is likely trying to balance leveled up Sims with new Sims at the beginning of their careers. This approach doesn’t disadvantage starting new stories, but at the same time also doesn’t validate progression. 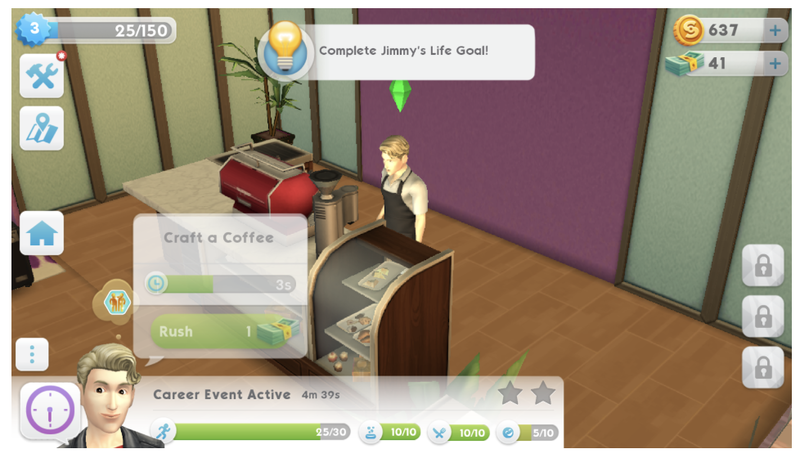 Comparing rewards of two Sims in the same household at different career stages feels frankly demotivating. Would players keep their old Sims forever if the difference would be more significant? 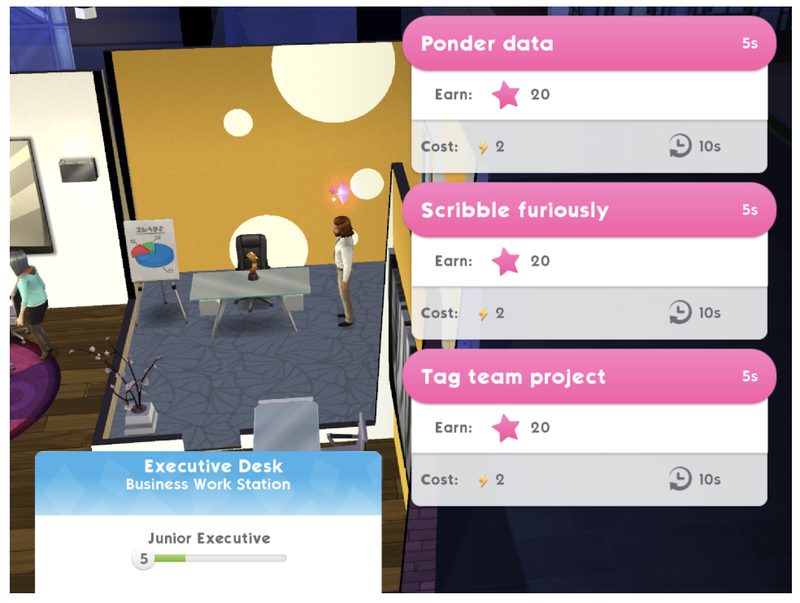 Do players value Simoleons higher than story progression? The combination of predictability of the actions, the lack of a meaningful story and the fact you don’t need it to play to progress, makes energy redundant. The design of events doesn’t communicate progression naturally. This seems to be a pattern in Sims Mobile: Instead of asking what player cares about, there’s an artificial measurement claiming a player that should care... just because. Systemically you are rewarded through the parties, but it is anticlimactic. There is simply nothing substantial that you could gain in the party system that you can’t gain somewhere else (XP, Simoleons). Everything about a party is mechanical: The number of parties you can visit per day, The number of parties you can host, The amount of energy you have at a party. There is no status to earn, no best-party-host leaderboard. Nothing to push me to become the party master. Providing social proof at the end of a loop to drive all motivations is a good design. However, in this case, it is executed poorly by not tying it to some kind of ladder or leaderboard. The party system isn’t terrible, but it doesn’t justify the existence of all the other loops. Its progress is very far away from day to day activity, and participating in them is optional. When the game first came out, the gameplay was actually much more similar to Sims: FreePlay. This article is worth checking for an early review. From screenshots and App Store versions we can get an idea how the game looked when first released and what were the major changes. 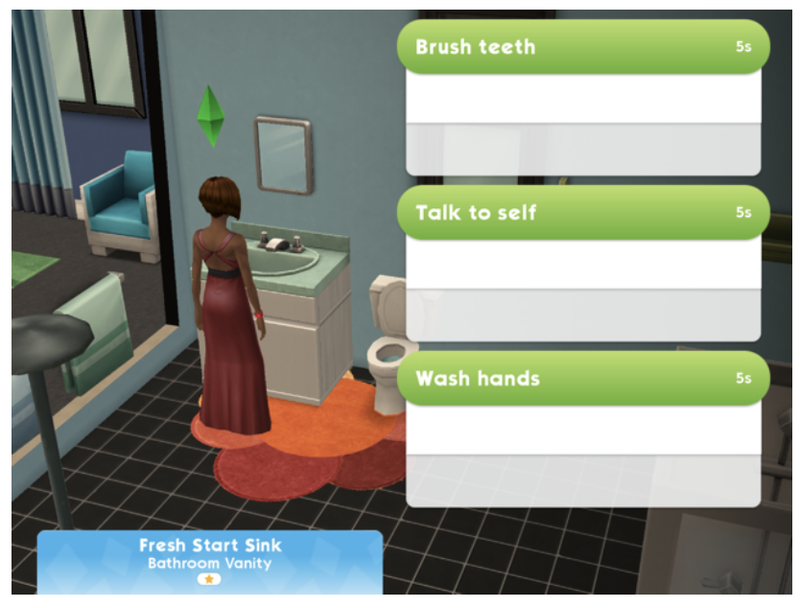 A Sim had a set of needs that gets refilled when performing actions. Timers, that lasted hours in the Sims: FreePlay were shortened, yet present. This leads me to assume that Sims Mobile didn’t start from scratch, but took mechanics from Sims: FreePlay for granted. My theory is that because EA used Sims: FreePlay as a basis, the design was already doomed. They attempted to patch what was there, rather than modernize the design. I can’t help but wonder what would happen if Sims Mobile was instead a port of Sims 4. My designer brain drools with joy over such challenge: Would players enjoy the game? Would the brand be strong enough to rely on vanity only to monetize? Would it be possible to build a system that parallels passive and active gameplay meaningfully? Instead, with Sims Mobile, we end up with a hybrid that tries to achieve everything and nothing. The Sims is a brand building on freedom of choice. As Matt Brown mentions in his GDC talk, a Sims’ actions and goals are built on improvisation theater’s “Yes and” principle: One thing always leads to next, there is no wrong move, there is no end goal to strive for, and things constantly change. Just like life. Instead of that, EA Mobile’s latest take on Sims Mobile is constantly afraid to give players space to act on their free will. Intrinsic motivation is replaced with simple reward structures, likely out of fear of losing players without rewarding their every step. Goals are unclear and sessions unrewarding. As a result, I believe that EA Mobile lost both the Sims fanbase and casual players alike. EA Mobile: Can the Giant Climb to the Top?